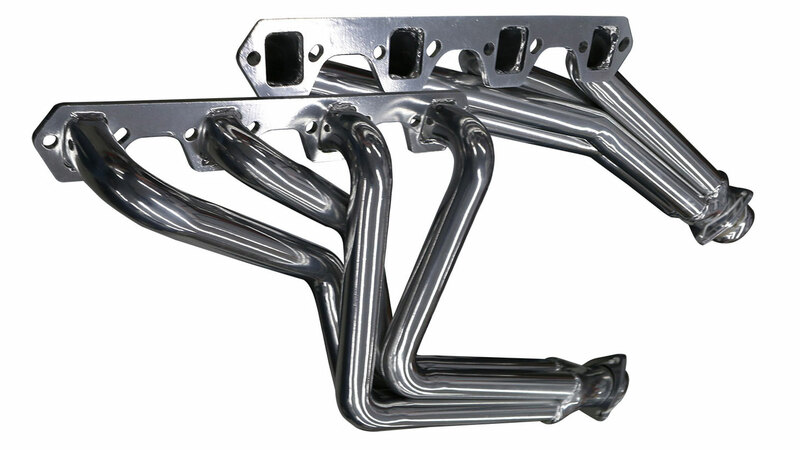 Our NEW POLISHED CERAMIC STAINLESS STEEL Long Tube Headers are designed specifically for the 66-77 Classic Ford Bronco. Our long tube headers provide more power and better sound than shorty headers. These headers were designed for the Early Bronco and therefore provide excellent clearance. It is even possible to remove & replace the starter without removing our headers. These headers are coated with a durable ceramic finish designed to handle temps up to 1350�. With 1 1/2", 16 gauge Primary Tubes and 2 1/2" Dome Style Collector Flanges and 3/8" Mounting Flanges, these headers are built for performance and longevity. The headers come complete with gaskets, collector flanges and bolts and are solid one-piece tubes, not 2 piece slide together tubes. Headers fit 289, 302 and 351 Windsor. New flange-style collectors, requires no gaskets! Included reducers neck down to 2" OD. NOTE: HEADERS SHOULD NOT BE USED FOR NEW ENGINE BREAK-IN!!! Use during engine break-in period will void the warranty of these headers. While these headers are designed to eliminate as many clearance issues as possible, if you have a manual transmission, you will need to bend the clutch bell crank rod for clearance. For fuel-injected 5.0 engines, these headers will work with GT40 heads. They will NOT work with GT40P heads. Use of aftermarket heads may potentially cause clearance issues. WILL REQUIRE MODIFICATION IF USING AN AUTOMATIC OVERDRIVE TRANSMISSION. Will require bending and grinding. Also note, due to the extreme heat that goes through the exhaust, the finish on these headers will likely discolor after the first few initial uses. To prevent this, the best option is to have them professionaly ceramic-coated.